The activities included visits to the city’s travel agencies, a training seminar for 60 travel agents and the participation of both destinations in the Cruise 360 tradeshow attended by 800 travel agents. The Promotions offices of the Riviera Nayarit Convention and Visitors Bureau (CVB) and the Puerto Vallarta Tourism Trust were in Vancouver, Canada from June 1-4, 2016 for a week of intense work. The first day included visits to several travel agencies in Vancouver. 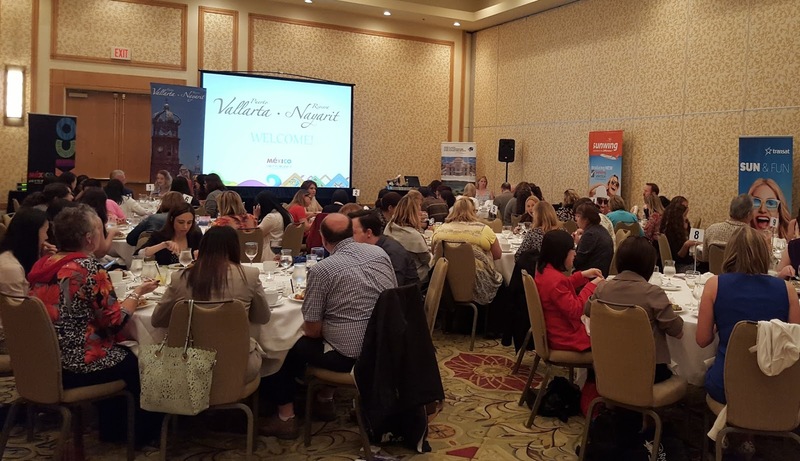 The next day, the team held a training seminar for 60 travel agents along with representatives from nine hotel chains from the destinations as well as tour operators Westjet, Air Transat, Sunwing and Air Canada, plus personnel from Aeroméxico and the Mexico Tourism Tourism Board in Vancouver. The Cruise 360 Tradeshow took place June 3-4 and both the Riviera Nayarit and Puerto Vallarta shared a stand at the event, which was attended by over 800 travel agents mainly from Canada with some from the United States. Four of the destinations’ hotels also participated in the show. To put the importance of Vancouver into perspective: according to the Riviera Nayarit CVB’s Barometer, in 2015, 32% of all Canadian visitors to the Riviera Nayarit came from the province of British Columbia, and Vancouver is the largest city in said province.